How a welcome sign might have looked. Click to enlarge. In 1861, eleven states seceded to form the Confederate States of America. However, unanimity did not exist within the new nation. In the case of the western, mountainous counties of Virginia, the division was so great that residents chose to form a new state, West Virginia, which remained part of the United States during the Civil War and did not reunite with Virginia after the war. East Tennessee similarly was generally pro-Union, though the remainder of the state was pro-Confederacy; particularly true the farther west one traveled within the state. So, did East Tennessee ever consider forming its own state? I consulted two books at the Public Library to learn the answer. 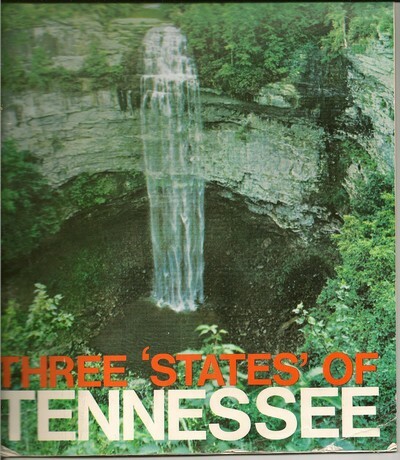 One was “The Attitude of Tennesseans Toward the Union” (Mary Emily Robertson Campbell, 1961) and the other was “Vanquished Volunteers: East Tennessee Sectionalism from Statehood to Secession” (Eric Russell Lacy, 1965). I encourage you to read those books for many of the details that I will summarize in this article. Tennessee was often divided on issues that dated to its once being part of western North Carolina. Some favored separate statehood, while others wanted to remain North Carolinians. After statehood was achieved in 1796, the natural topographical differences of east vs. middle vs. west became apparent as settlers moved about the new state. In the antebellum years, groups divided on social issues such as crime and punishment, dueling, gambling, and temperance. Eastern Tennessee became more industrialized than the agrarian counties to the west, and was thus more closely aligned with the industrialized states in the North. Views on slavery divided Tennesseans greatly, though not always along east/middle/west lines. Lincoln’s victory in the 1860 election was followed quickly by secessionist response.. On December 20, South Carolina became the first state to secede. Tennessee Governor Isham G. Harris called for the General Assembly to hold a special session beginning on January 7, 1861. The governor recommended that a referendum be held in which the voters would decide if a state convention would be given authority to provide Tennessee’s response. The convention was rejected by voters, with East Tennessee voting in large numbers against the idea. The April 12 firing by Confederates on Fort Sumter prompted Gov. Harris again to call the legislature into session. Author Eric Lacy noted that “the Governor again blamed the crisis on Lincoln and called the Union a curse, an “engine of oppression” headed by a tyrant (President Lincoln). He recommended annulment of the state's connection with the Federal Union. * The secession and military alignment with the Confederacy was unconstitutional and illegal. * The General Assembly should “consent that the counties composing East Tennessee, and such counties in Middle Tennessee as desire to cooperate with them, may form and erect a separate state." The proposals were presented to the legislature, but essentially went nowhere due to political maneuvering. A legislative committee questioned the legitimacy of the East Tennessee convention representatives to speak for the wishes of their section. Others noted that West and Middle Tennessee, though having a vested interest concerning the East for the overall well-being of the state, had no opportunity to vote on separate statehood for the East. Tennessee’s days with the Confederacy were brief, as Federal troops began to take control of the state early in the war. Numerous battles were fought within the state’s borders. Many pro-Unionists in East Tennessee welcomed the presence of Union armies, since they helped to protect them from attacks by Confederate sympathizers. At Harrogate, Tennessee, near Cumberland Gap, Lincoln Memorial University was established to honor President Lincoln for his interest in the area. There is an excellent Lincoln museum on the school campus. As Federal soldiers moved into Tennessee, Gov. Isham Harris moved out by fleeing to Mexico and then to England. He returned in 1867, became a Memphis lawyer for ten years, and was then elected by the legislature to serve in the United States Senate. Tennessee was the first state to be readmitted to the Union. The end of the Civil War, however, did not end the talk of East Tennessee’s secession from the rest of Tennessee. Sectionalism resurfaced in 1866, when a mass meeting in Knoxville renewed the call for separate statehood. Sectional divisions were a target of the administration of Gov. Winfield C. Dunn in the early 1970’s. 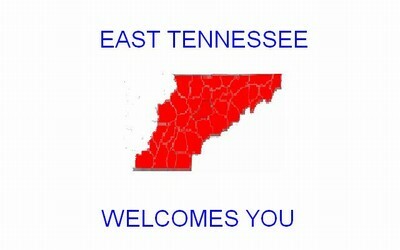 In a spirit of Tennessee unity, he issued an executive order to change the wording on signs at the state’s border from "Welcome to the Three States of Tennessee" to "Welcome to the Great State of Tennessee." Please send me an email at jolleyh@bellsouth.net if you have additional information on the East Tennessee statehood movement. "Three States of Tennessee" travel booklet of the Gov. Buford Ellington administration. Click to enlarge.